St Stephen Lutheran Church Pittsburgh, Pennsylvania: Your Questions Please! Bread, Wine - And Water? Your Questions Please! Bread, Wine - And Water? Someone asked me why I put a little water in the chalice of wine before communion. It’s not a ‘necessary’ thing; in other words, if we didn’t do it, the Eucharist would not be ruined. Most Lutherans probably don’t mix the wine with water. So, what’s the point? Before I begin, a confession: sometimes I do things that I don’t understand myself. I pick up things and assume there is a good reason, because there are usually reasons behind tradition. So it is with this particular ritual action. Originally this was simply good Greco-Roman social custom – to dilute strong wine with water for what we would call ‘social drinking.’ But the wine and the water together came to symbolize the unity of Christ’s divinity and humanity. The water symbolized humanity; the wine divinity. Once water is added to wine, it can no longer be separated. So it is with Christ, who is both God and man, and yet he is one indissoluble person. The cup of mixed wine and water symbolized and illustrated this developing doctrine of the Church. 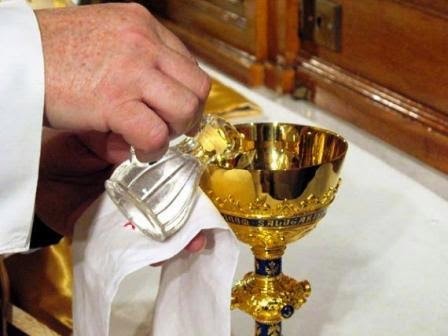 So, while it is not nearly as important as using wine (which is done according to the Lord’s command), the continued practice of mixing wine and water is both a connection to the ancient tradition of the Church and can be a helpful testimony to the identity of the Christ who is present in the Eucharist. Sources: Senn, Frank. Christian Liturgy: Catholic and Evangelical. Minneapolis: Fortress Press, 1997.